Image of Olympics is often related to peace, but this year, China, where there is no freedom or equality, is hosting Beijing Olympic. When China was chosen for the host nation of Olympic, the government promised to improve the human rights in China. However the suppression from Chinese government in East Turkistan is getting harsher adversely. To protest the Chinese government, Uyghur organizations all over the world held protest demonstrations with the encourage of World Uyghur Congress. The demonstrations were intended to be held at the same day that the Torch Relay enters in East Turkistan, but as China suddenly changed the date of Torch Relay entrance, some demonstrations in different countries were made on different days. Japan and EU headquarters decided to stick to the first plan and stage the demonstrations on 25th of June. We held the demonstration beside the China Embassy in Roppongi, Minato-ku, Tokyo in Japan. As it was the first time to have such kind of demonstration after WWII in Japan and it was a business day, I thought it would be a good success if 50 people could participate but surprisingly, more than double of my guess, 130 people (reported police) participated. Organizer was Japan Uyghur Association of World Uyghur Congress. Mr.Ilham has been a World Uyghur Congress representative of Japan, he is now also a Chairman of Japan Uyghur Association that is recently established. We had an opening ceremony in Mikawadai park from 1 pm. Mr.Uezono served MC and Mr.Ilham, the promoter, gave the first speech. "I would like to thank you all for gathering and supporting us. Though Chinese government promised the improvement of human rights, we are mistreated awfully. We have plenty of natural resources such as oil, yet we have to go to cities in mainland China to work. Especially the young females aged between 18-25 are taken away in huge number. Only 5% of the graduates and diploma holders are getting hired. Uyghur children must study in Chinese, not in their own language. We will make peaceful activities for the right of self-determination. I will ask you, who joined us today, for the support." Mr.Hideki Nagayama from Taiwan research forum delivered a speech. Mr.Kosaka from Arakawa ward assembly who has been focusing on East Turkistan issues in his blog for quite some time also made a speech. "As a Japanese citizen, I have to apologize to people in East Turkistan. We have given more than 3 trillion yen of ODA knowing that China is oppressing Tibet, East Turkistan and Inner Mongolia, the technical transfer from Japanese companies are taken for military use and Japanese beer company's factory is operated by the Chinese army who are suppressing East Turkistan. As the media is not reporting the truth, the Japanese citizen cannot get to know those things. What Japan is doing is obviously wrong and we have to appeal to people to realize it. I am very glad that many East Turkistan supporters gathered today to create a good opportunity to let people know about it. I hope 25th June will be the day that will be remembered as memorial day of Japanese people gathered for East Turkistan. With the respects to Mr.Ilham and the supporters, I would like to keep bringing out the words on East Turkistan." Mr.Shiraishi, Adviser of Japan Uyghur Association, has been supporting the Uyghurs in Japan for a few decades. He has been providing cares for about 1,500 Uyghurs and he has made up his mind to stand up as Uyghurs are going to be perished if the political action is not to be made. He applied for the demonstration and contacted media and politicians for this demonstration. "Since 1985 Uyghur people has been coming to Japan to study and currently there are about 700 Uyghurs studying in Japan. There are only a few Uyghurs participating this demonstration today. If they join this kind of activities, they will not be able to go back to hometown and the family back in China will be in trouble. This is why none of the students stepped out and make an action. However when Ms.Rabiya Kadeer came to Japan, Mr.Ilham decided to be an interpreter and with the strong determination not to return to China ever again, he decided to speak up. I would like you to support him." Mr.Makino from Save Tibet Network made the last speech in the opening ceremony. East Turkistan team has joined their activities and this time Mr.Makino supported us by joining the demonstration. "I would like to thank East Turkistan parties for participating and supporting us with the demonstrations on 21 March and 6 May. People suffering the violation of liberty and human rights under Chinese Communist Party should make actions jointly irrespective of the ethnos, borders and the position. I got to know a Uyghur from East Turkistan who was involved in a movement of East Turkistan on the second World Parliamentarian Convention on Tibet. He told me that if the Chinese government found out that he was involved in the movement, he would not be able to see me ever again, but he would shout for independence of East Turkistan even risking his life. It has been 15 years and I have not seen him since. 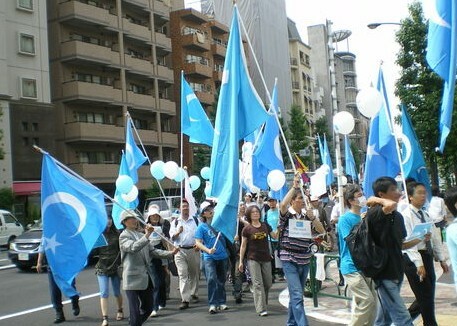 I am glad to know that East Turkistan parties are empowered to have such kind of demonstration in Japan. I have heard that there are 500 thousand people were victimized as political criminal and 700 thousand people were victimized by the nuclear test. Additionally, females are forced to migrate to inland China. This kind of awful things are not permissible. A human has right to be happy no matter where he/she was born, but Chinese government is killing the people who do not fit their policy. To gain the life, freedom and democracy in China, let us hold hands together and fight this battle." We started the demonstration at 1:30 as scheduled. 130 participants shouted 'Free Uyghur', 'Free Tibet' and 'Free Inner Mongolia' in the march. People at the forefront wore hand cuffs, paper hat and blindfolded to play a Uyghur political criminal role. As it is not familiar to Japanese, people might not have recognized what that meant. 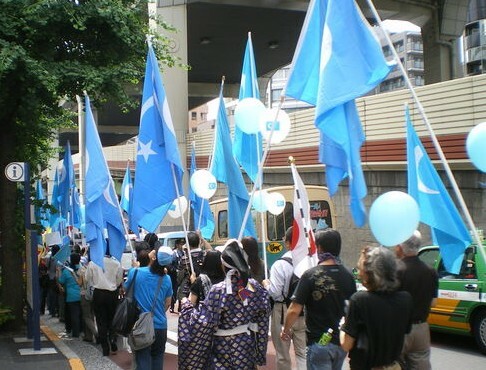 We had about 60 East Turkistan flag together with signs and yellow banner and appealed to people in Roppongi. We handed balloons, origami and flyer's and a lot of people accepted them though some rich mommies snapped when the kids asked for the balloons. Demonstration followed for 1.5 km or so and we reached Kougai Park, the finishing point, much faster than I expected. The march lasted for 30 minutes and a lot of participants felt that the appeal was not enough. We had closing ceremony in Kougai Park. Mr.Miura, who has been supporting the North Korean defectors made a speech. "I would like to talk about East Turkistan. People there are Turkic people and China call them terrorists. Buddhism arrived that region first and then Christianity and Islam followed. There were a lot of Buddhist temple ruins there, they were not destroyed by the people living there with the Islamic belief, but it was destroyed by the Cultural Revolution. In Ottoman Empire, Jews and Arabs developed their own culture. By separating the Islam and the politics, Turkey is being a pioneer of Islamic society like Japan was the pioneer of modernizing East Asia. Chinese government used to destroy ethnic people's culture by communism but now it is destroying ethnic people's culture by greed. We have to point out Turkey that accepted different culture." Mr.Dasi, the vice president of Inner Mongolian People's party also gave a speech. "We, Mongolians and Uyghurs are sharing the same fate in China. Inner Mongolia is the region governed by China as Inner Mongolia Autonomous Region. We have suffered terrible suppression and cultural persecution for 60 years. At one time, Outer Mongolia and Inner Mongolia belonged to Manchuria but then we had a fair autonomy and the emperor paid us respect. In Qing Dynasty, Mongolians common language was Mongolian for 300 years. However since we became part of People's Republic of China, we are forced to learn Chinese in the school and now 2 millions of Mongolian out of 6 millions of Mongolians living in China are not able to speak Mongolian language. Recently 3000 children were transferred to Chinese school. If it continues, Mongolians in Inner Mongolia are going to be disappear within 100 years. It is more like a problem of existence of a people rather than a issue on independence. Uyghurs are suffering the suppression and cultural cleansing as well as we do. I ask Japanese for the support for our battle." After the speeches, Mr. Ilham and 4 other people left to deliver a protest statement to China Embassy. Sending them off, we retrieved and sold the flags and asked people who hope to get information on East Turkistan events to write down their personal information so that we can contact them on the events. As one person made a donation box for us, we asked the participants for the donation. For the sales of the flag, we will donate it for the cheering group of Mr. Ilham and we will devote the donation for the demonstration cost. We thank you very much for your kindness. I have heard that there was a 'consideration' for the China Embassy sending 5 protesters at most. Mr.Ilham and others went to China Embassy returned safely. Though Mr. Ilham haltered when he read the protest statement at the closing ceremony, the people went to China Embassy told me that he could read aloud the statement augustly in front of the China Embassy. As Japan Uyghur Association is established after the Vise President of World Uyghur Congress, Mr.Seyit's, visit to Japan in mid June, Japanese have prepared for the demonstration. Application for the demonstration, preparation for the demonstration, planning, MC and leading the chants are all conducted by Mr. Ilham and Japanese supporters. Because it was the first time for us to stage a demonstration, we could not think of what it would be like. We did not know how many people would be participating, how the demonstration will develop, what kind of accidents would happen, how to handle the accidents and so on and on. We had 15 staff and we thought we could handle a demonstration with about 50 participants. The things that we expected to have some trouble went smoothly and things that we did not expect to have any problem gave us trouble. Because of that, we, staff were in a mess at the closing ceremony. We had much more participants than expected and the chants did not reach the people at the line end. We had not planned to put someone in the middle of the group to lead the chant but luckily someone who is used to joining the demonstration came forward to be a chant leader. But we failed to pass the paper with the list of chants to that person. It was a demonstration with a lot of challenge for the next one and we caused trouble for the participants. I was in charge of the project though the demonstration in March was the first time for me to do anything with demonstrations. We had staff who had participated demonstration regularly but none of us had experience of staging a demonstration. Everything was the first experience for us, yet we somehow did it. All the staff and unofficial staff who join the project in the morning did a great job. As we had 130 participants on the business day in the afternoon and we have to increase the number of staff for the next time. We are now considering of having another demonstration on the weekend before the Beijing Olympic starts. I hope more people would participate for the next demonstration. After the demonstration, people around Ms. Rabiye of World Uyghur Congress in US contacted us and told me that Ms. Rabiye and 200 Uyghurs in Europe participated the protest demonstration in front of the Council of the European Union (Brussels, Belgium) on the same day as we conducted the demonstration. even though Japan Uyghur Association is newly established after Mr. Seyit's visit and we did not have much time to prepare. First report was made in France by AFP and the people called us straight away watching the news. It was not only the organizer and the staff who were surprised and impressed, but also the officials of the World Uyghur Congress. Let us make them surprise more for the next time. Followings are just for the information. Beijing Olympic Torch Relay planned to enter East Turkistan (so-called Xinjiang Uyghur Autonomous Region) on 25 June suddenly changed the date to 17 June and it passed through East Turkistan under the complete military supervision.The people who filled the streets and ceremony places were all organized by schools and working places. There was a notice for the general public ordering them 'Not to go out. Not to watch the relay from balcony or through the window. Watch the relay on TV." and they were even prohibited to enter the roadside. Not only the roadside, but the markets, shops and department stores near the stations and Uyghur concentrated areas were conducted by the authorities and closed early on 16 June and did not open until the Torch Relay concluded. Though Olympic and Olympic Torch Relay are supposed to be a festive event that represent the peace, the Torch Relay in East Turkistan became the grand show of the dominance of Chinese Communist Party's totalitarian regime. Body search and Identity check at various points, fully armed snipers everywhere and Uyghurs trapped in the house because of the curfew. Torch Relay in East Turkistan showed China's colonial ruling against the Uyghurs who are supposed to be the main people to the whole world. Chinese government is sending thousands of Uyghurs to concentration camps and prisons without any legal procedure under the pretext of safety of the Olympic. Foreign media are monitored by the authorities so that they cannot contact Uyghurs and Uyghurs are warned never to contact foreigners. Uyghurs are protesting peacefully in various ways against the fierce state control. But instead of granting the request with good conscience, Chinese government presume all the requests, complaints and protests defiance against the state regime and suppressing them completely by pay forfeiture, firing from the work, house arrest, prohibition of travel, imprisonment, public trial, secret trial, public execution and assassination. It is a terrorism of a nation. On the other hand, they are using the Olympic to perform the alignments of all the ethnos under China's control, including Uyghurs, to the global community. We, the Uyghurs in Japan, respond to the World Uyghur Congress and make a demonstration together with Japanese in Japan for the first time after the WWII to protest the abject Chinese government. We request Japanese citizen and Japanese government to denounce Chinese annihilation plan for Uyghurs and colonization of East Turkistan. We also request them to support all the activities we do with right of national self-determination. We request Chinese government to observe the Olympic Charter and grant the high autonomy that has been promised. We request Chinese government to stop the policy that sends mass numbers of young Uyghur females to mainland China and make them work in slavish factories immediately. We request Chinese government to reform the education system that is aiming to destroy the Uyghur culture completely, stop the forcing Chinese education and return the right of education to the Uyghurs. We request Chinese government to release all the Uyghur political criminals including Tohti Tunyaz of Tokyo University immediately. Tokyo Shinbun reported this demonstration in its evening edition. 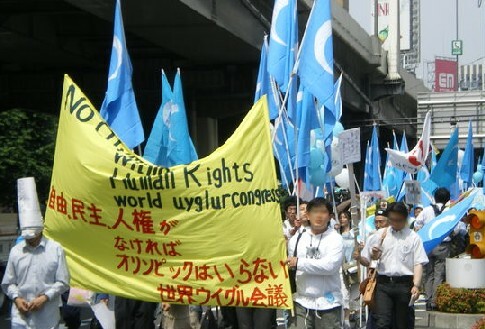 "World Uyghur Congress", (based in Munich, 20,0000 members) organization made by exiled Uyghurs, set up a Japanese branch called "Japan Uyghur Association" ( Representative: Ilham ) and the association carried out the first demonstration against China's suppression against Uyghurs. 150 participants including Japanese supporters displayed a banner reading "Stop the assimilation in China" and appealed " we are against the Olympic without human rights". There were Uyghurs living in Japan (approximately 800) participated but some of them wore mask to cover the face fearing that China's eye. After the demonstration, the representatives delivered a statement protesting the suppression to Chinese Embassy.